Another grinnin’ and swingin’ Gobbo got finished today, old classic by no other than Kev “Goblin Master” Adams. They are so full of personality and such a joy to paint; fast to prime, fun to add details. I’ve got a box full of these maniacs just waiting for the right mood to hit me. The face shields are very much inspired by the minis painted in the 80’s. Some of them are more three dimensional when others are flat and more picturesque. Again, I am in awe… nothing else to say really, simply beautiful. To me these represent the golden age of GW orcs and goblins. These old miniatures had so much character and have never been equalled since. Your painting is just gorgeous. I’d actually forgotten the John Blanche face shields and checked shield rims. Makes me want to paint fantasy miniatures again. These are absolutely gorgeous, Kari. The paintjobs are superb, a perfected version of the gritty 80s style, in a way more 80s than anything painted back then. 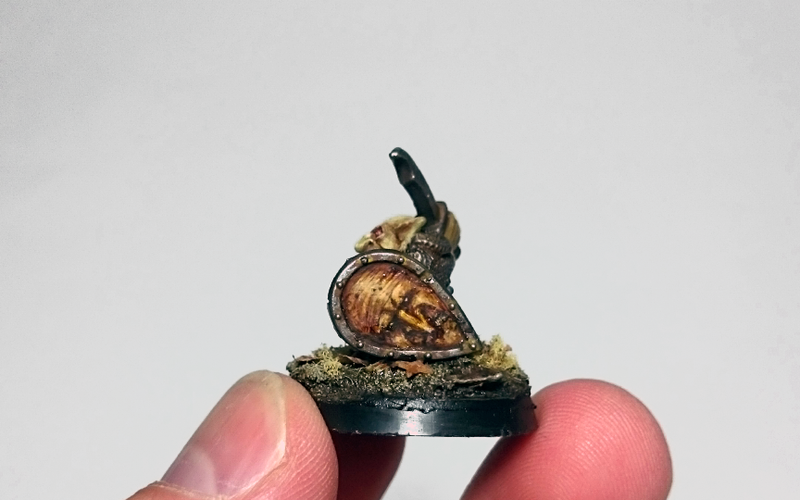 I’d love to see you paint some of Kev’s Harlequin Goblins. To me it’s GW goblins or nothing. Absolutely wonderful Kari. The old school shield is simply stellar. Painting these old Kev Adams minis is so much fun isn’t it? It is a very nice break from the “serious”, superdetailed modern minis. 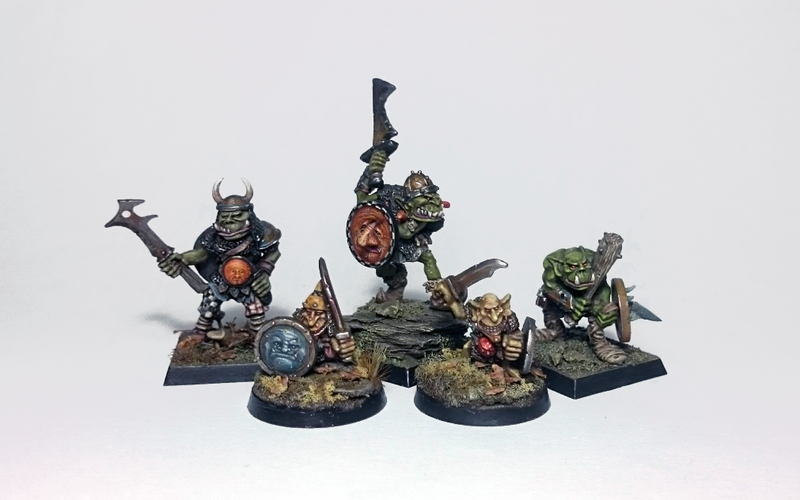 Blue works really well on gobbos – I talk from my own experience as I did a whole smurf-themed goblin bloodbowl team once… (They were of course called “Smurftown Smurfers”). Cheers mate! I simply can’t resist the old O&C stuff, therefor I have plenty of them in my drawer. The simple design makes them ideal for quick sidetrack projects – and apparently great way to get back to painting after a long painting break. I tried to find your Smurftown Smurfers but the quick search didn’t give any results. Any chance you could share a link to them? I’ve never taken any photos of them actually… But they’re here somewhere… I’ll snap you a pic or two! Those old school minis are really cool. I enjoy painting them from time to time a lot. For me the hardest decision is to choose the painting style. Go old school, go mid age (around the 90ies with lots of bright colours) or paint with all the fancy techniques that are around today. Wow. What a perfect time-machine you have created here, slicing a hole through time to reach some damp twisted fairytale world. 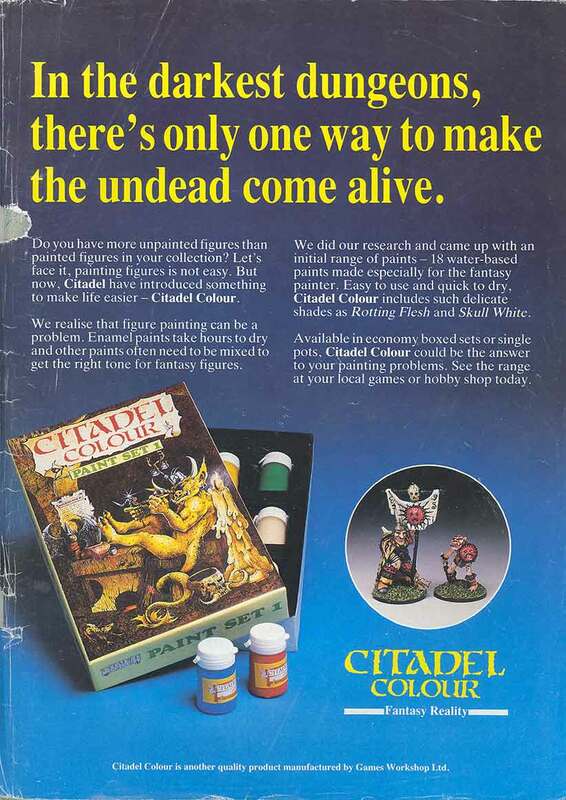 Of course you know that Orcs were not always green, not in Tolkien and not always in Citadel Miniatures either. Lovely work, thanks for sharing. I’ve recently been going through a bunch of John Blanche’s fantasy illustrations and I can’t help but think how well these guys would fit right in. Kari, these are simply incredible. Absolutely! I love these! One of my favorites so far. I caught the oldhammer bug myself and have been painting old chaos warriors for the past couple days. I just finished painting the best banner I’ve ever painted. I love your shields too. I have a few old goblins that I’ll be starting on after I’m done with my chaos warriors. Hopefully they come out as well as yours did.